Unfortunately, due to Mother Nature's overcompensation for the drought in Atlanta, I won't be riding my bike today. But all is not lost, I have an exciting announcement related to riding. I'm a competitive cyclist and many of the routes I use for training just happen to take me through Atlanta's most architecturally-rich neighborhoods. Awhile back I started taking my camera along on my "easy" days when I'm just out to stretch the legs and not worried about how fast or hard I'm riding. On these days I take pictures of the houses with the most inspiring architecture and landscaping. I also scout out interesting new construction. I've collected a wealth of pictures and am going to start sharing these photos (and any details about who the architect, etc. were) in a series named: Ride-by Architecture. Specific addresses are ommited for privacy's sake unless it's a home that's for sale where the owner might benefit from some additional exposure. The first home is in Brookhaven and completed construction in the summer of 2008 I believe. The home was designed by Neely Design Associates, a bit of an "under the radar" Atlanta firm that doesn't get mentioned much but consistently churns out beautitful architecture. The house immediately stood out to me because of it's beautiful steel window and slate roof. If you look closely (click the picture to enlarge it), you will notice several interesting details. 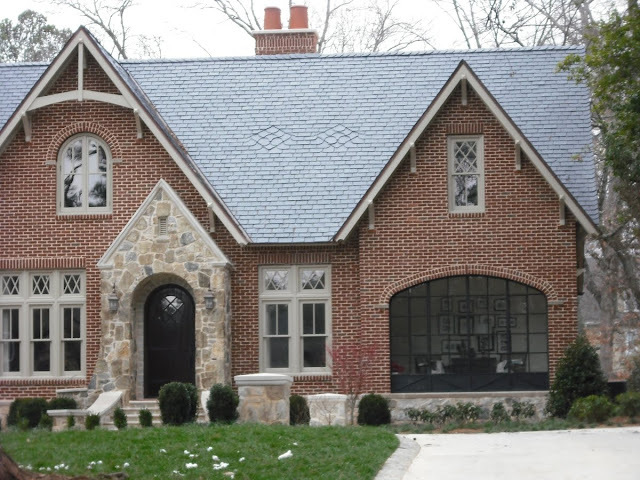 First, there is the unique inlaid pattern in the slate roof between the gables. I think this is the first and only time I've seen such a detail. It really gives the house a subtle hint of character. Of course, I like the limestone accents on the stone work. And the steel window facing the street is pure perfection. A close look will reveal the added detail of diagonal lines in the solid section below the glass panes of the window. The mullions in the windows and round window in the front door are also an excellent touch. The interesting thing about this home is that its size is deceiving from the street. The front elevation gives the impression that it's a smaller, older home. However, in person you can see that the home extends back into the lot and is large enough to accommodate all of the modern conveniences. 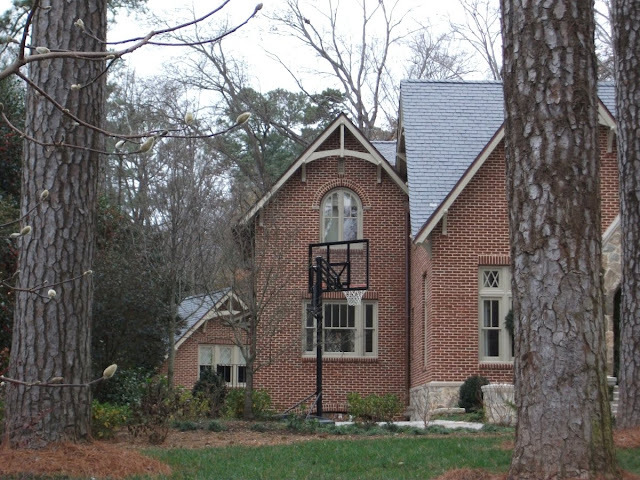 If you look closely, behind the basketball goal you will see that the driveway dips down and goes below the left side of the house in what appears to be a port o'cochere. Behind that is the garage with presumably finished space above it. I hope you enjoyed this first intallment of Ride-by Architecture. An expert (or anything close to one) I am not at photography. I've been trying to glean what I can from my new friend Blayne's blog. Perhaps I'll learn a thing or two and future photos will better capture the beauty of the homes I'm finding. I can already tell I am going to like this series! I have friends who have used Frank Neely, and say only great things about him. I also have an interior designer friend who often works with Frank on his new home projects, and says he is extremely talented and very easy to work with. Thanks so much. You've helped me spot some details I'll check out this week. The diamonds on the roof make me realize that the more we look, the more we'll see. I cruise Brookhaven at least once week. I saw this one going up. I'm afraid if I slow down too much, somebody will call 911 (but that's what we architecture tourists do). Brookhaven has a lot of architectural bang in a compact area. The lots are small enough that houses can't hide from you and your eye can take in many houses at once, more neighborhood than estates. Seems to be an ethic of not being too flashy (with some exceptions), of not looking too new, of camouflaging bigness (with exceptions), and a variety of styles - but few moderns. Still a lot of houses that haven't been "done" yet. 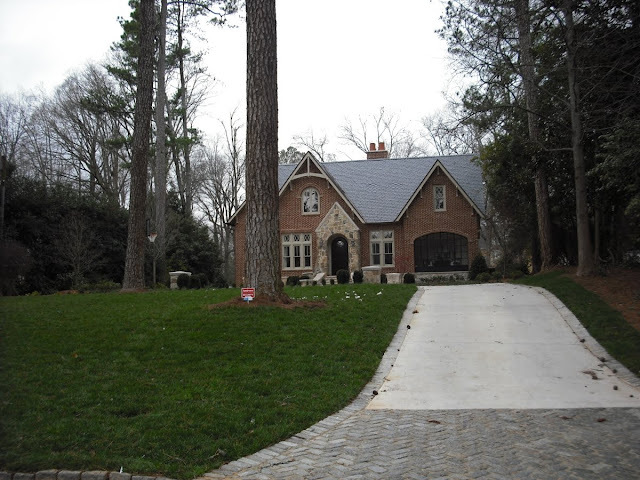 I just found this quote, "In an Atlanta market addicted to empty-calorie McMansions, Neely strives for historical authenticity. 'We won't work anywhere outside of Atlanta's few historic neighborhoods,” says Neely, whose forte is designing infill houses that look as old as their neighbors. “The goal is always that the house looks like it was built in the 1920s,' he says." we could all learn a thing from that idea...75% of my favorite houses turn out to be built in 1929! I can't think of a better decade to emulate. This is absolutely fabulous. I use to be an avid cyclist, but alas my knees decided they had other ideas! This is very exciting sharing all your good finds along the way. Best wishes for continued grand routes - looking forward to more Ride-by Architecture! @Things That Inspire: I'm seeing Neely's signs more and more now. All of the homes have great scale and attention to detail as well as quality materials. @Terry: I know what you mean about stopping in front of houses and wondering whether someone might think something fishy is up. I guess that's the age we live in. Luckily on my bike I can just be having a water break and am less suspicious looking. BTW, your blog has the perfect name: Architecture Tourist. If you hadn't taken it, I would have wanted to use that name myself. It's perfect for what I'm always out doing. @Terry, @Doug: I love the 1920s houses too. I think the trick for new homes is to focus on quality over quantity in the square footage. @Tina: Always glad to know a kindred spirit. Cycling is my passion. I do like this house... because I married a Contractor it is possible...the roof by the basket ball goal might have or develop water problems...I know, I just can't help it...sorry. He rubbed off on me. The details in the front on the roof are something I haven't seen either and I am wondering where you would find roofers who had artistic abilities...just a beautiful idea. I am a huge fan of the 1920's, If you ever go to Dallas, check out Beverly Ave. wow! @Lee: Interesting observation about the roof. I had not noticed that detail. I can definitely see a possible water problem, especially with all the rain we keep getting. I have Texas on my list for architecture tourism. There are so many places I want to visit just to stroll through and see the houses. Imagine my delight in stumbling upon your blog! You've managed to cover all of my favorites in just a handful of blog posts: Kay Douglass, Bobby McAlpine, steel windows...not to mention architecture in general and, yes, boxwoods, a staple in my midwest garden. Through the blog world I have determined that Atlanta has some of the most beautiful homes in the U.S., and some really incredible designers. I look forward to following your blog. really a beautiful image -love the house. However, are you sure those are steel windows (the tan colored ones)? They look more like painted wood -obviously the black framed one is metal - the mullions are too thin to be anything else but steel. @ArchitectDesign: Welcome to my blog! I've been following yours for sometime now. Sorry if the post was misleading. Only the black window is steel. @Kate: Glad you found the blog. I'm hoping to have more landscape architecture-related posts soon. @FROM THE RIGHT BANK: Atlanta is a design lover's paradise. I think you'll enjoy it. Doug (Tracery) told me about your blog over lunch last week. So glad to know about it! This is going to be a great series as we have a ton of terrific homes here. I have an appreciation for architecture but not tons of knowledge so it's fun to learn a bit! I am a big fan of deceptively large- like the cute little cottage look with surprising depth- and a house one could get lost in. Great idea about Ride-By Architecture. I have taken many a ride all over my town to take in some of the great homes. Never even thought about taking a camera with me. My wife found your blog a couple of days ago, please keep the posts coming, we both enjoy your aesthetic and eye for detail. The pictures from some of the interiors you have posted are jaw-dropping! I just started reading your blog and in my previous comment where I mentioned you must be my long lost twin, I forgot to say that I LOVE quatrafoils! Anyway, I know Frank, the architect (or his firm at least) of this house. Side note... my husband just saw his parents house this week, which Frank designed, and said it was extremely well thought out/planned.